The Standing Committee on Crisis and Disaster Psychology was established in 2001 and you can read details of its work on their ministe. They consider prevention as a primary focus of their work and developing systems across Europe so that this is delivered effectively is critical in this area. Adequate psychosocial intervention following disasters can reduce ill health and foster resilience if handled appropriately. The Standing Committee on disaster, crisis and trauma psychologists wants the citizens of Europe to have access to comparable psychosocial services regardless of where they live. By a more systematic focus on psychosocial support within each member State’s emergency planning, by proper training of volunteers and professionals, and by describing a minimum level of care for those who experience disasters, this aim can be reached. As an example you can read about their work on their website. 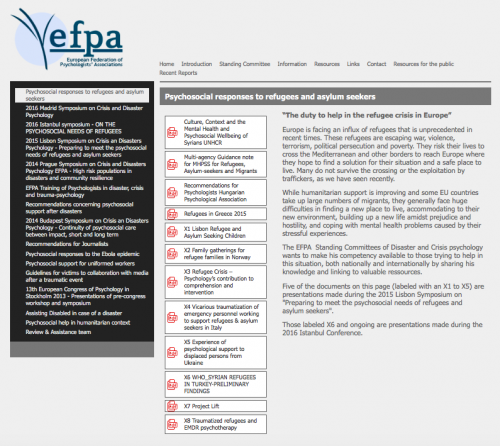 The page below details their work concerning refugees and asylum seekers.